Carole Barrer, Blue 5. Acrylic on canvas. Image courtesy of Art & Soul. Photo of artist. Image courtesy of Wendy Simons. Diane Culhane, Reaching High. Collage papers from sketch book, acrylic, pen and ink, and charcoal on birch wood panel. Image courtesy of Art & Soul. Tracy Lang (2005 Amy Award recipient), Resist. Powder coating on steel. Image courtesy of the artist. The Amy Award: Where Are They Now? An exciting group exhibition surveying current work by past Amy Award recipients who were honored in the visual arts. You might be surprised by where life, and art, have taken them. Presenting the works of Adam Bentz, Jonathan Hallet, Solia Hermes, Annie Huntley, Tracy Lang, Wes McClain, and Raquel Stanek. These annual exhibitions are reliably heart-melting. Even better, students get a chance to experience what it’s like to participate in a professional local exhibition. See elementary school work during the first half of May and high school work during the second half. 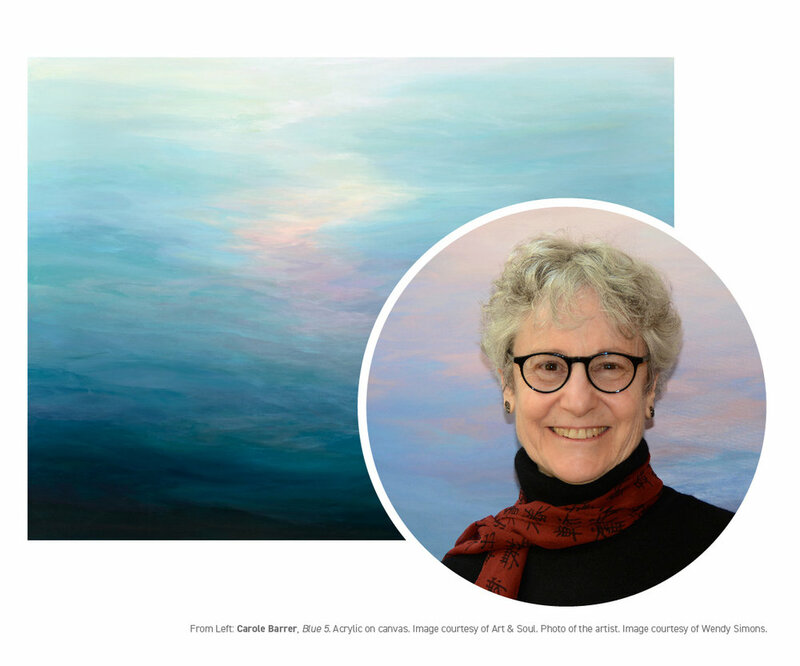 Join us for our opening reception during the First Friday Art Walk in downtown Winslow on Bainbridge Island, just a short walk from the Bainbridge ferry terminal. Please join artist Holly Ballard Martz for her informal talk, Jumping Into the Fray, as she discusses the process, inspiration, and journey that led to her self-described midlife rebellion and the politically charged work in her latest exhibit, State of the Union.